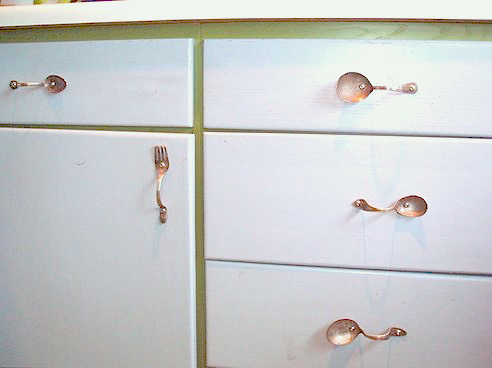 Make a real statement by replacing every drawer pull / cabinet handle in your kitchen with ones made of old silverware. 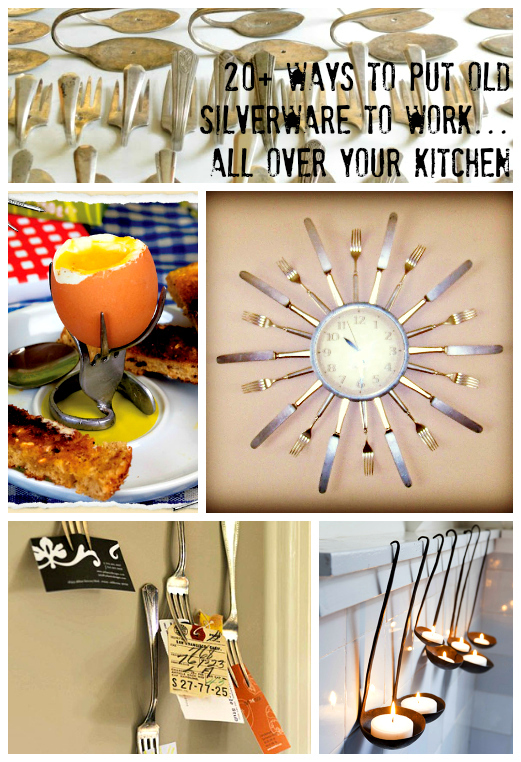 Check out this version from Little Green's kitchen ... silverware-as-hardware but with a different aesthetic. 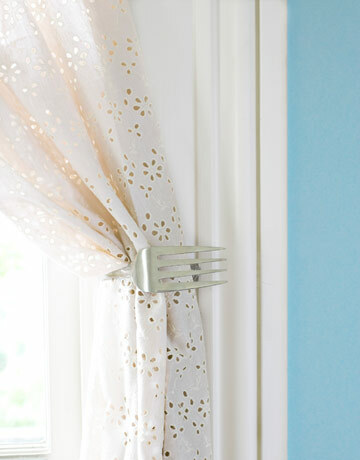 This is a really simple but very effective idea: silverware as curtain tiebacks. 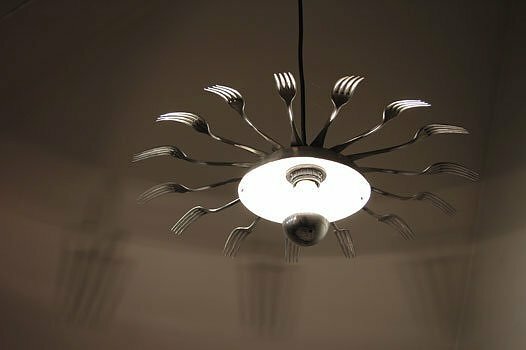 Get instructions for the fork here. For a variation on the idea (spoon) go here. My friends Matt and Betsy recently had their home featured on Apartment Therapy. 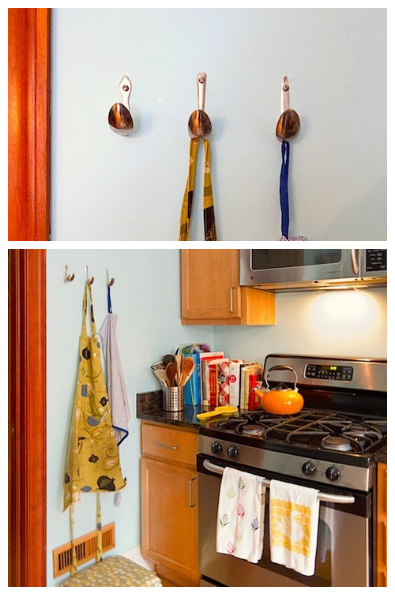 I love the simple silverware hooks in their kitchen (pictured above). To make them yourself, get instructions here. I have a sort-of-a-coatrack in my eat-in kitchen. So I will argue that this project does, in fact, involve something that could appear in/near the kitchen. But really, who cares! 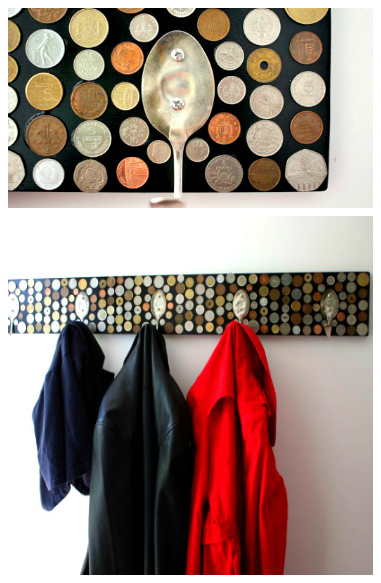 This awesome coatrack from Snickerdoodle Creations repurposes silver spoons and a coin collection. I think the result is wonderful. Complete how-to here. 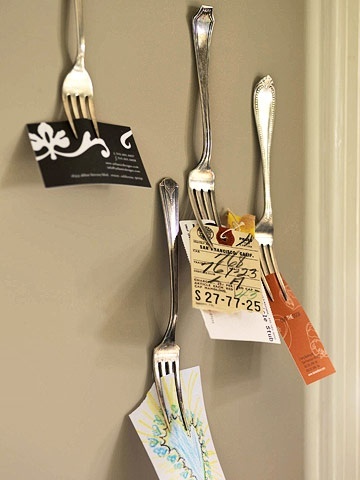 A fun flip of the silverware-as-hooks idea. Simple storage / display - instructions at BHG. 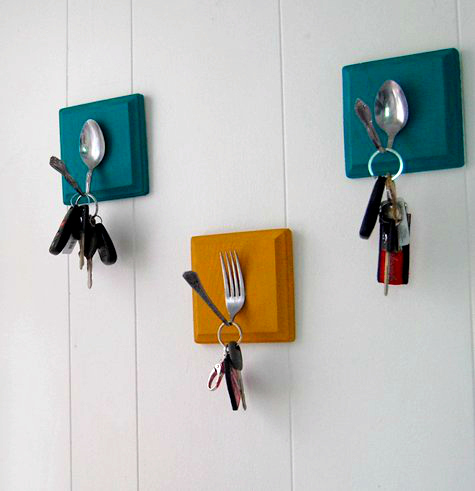 This Design Sponge key rack has been doing the rounds recently. The really great colors don't hurt! 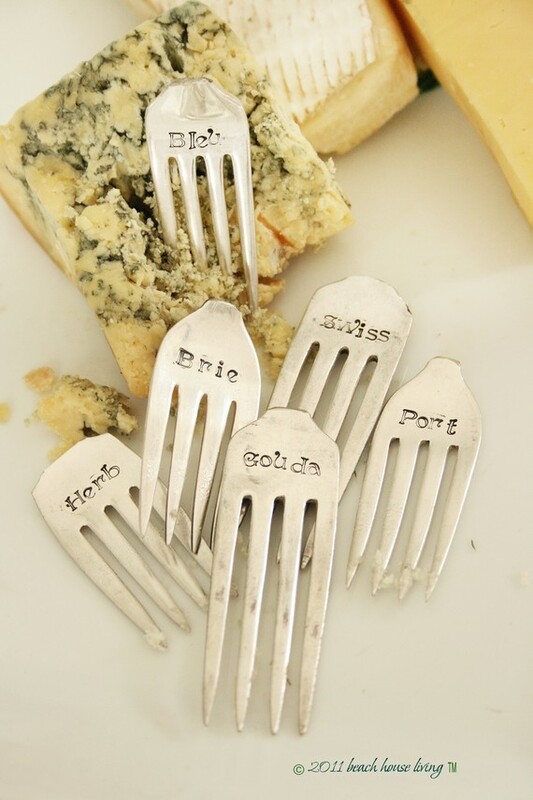 Not really silverware, but I love the effect! And something about this makes the cooler weather on the horizon a little less depressing. Via. 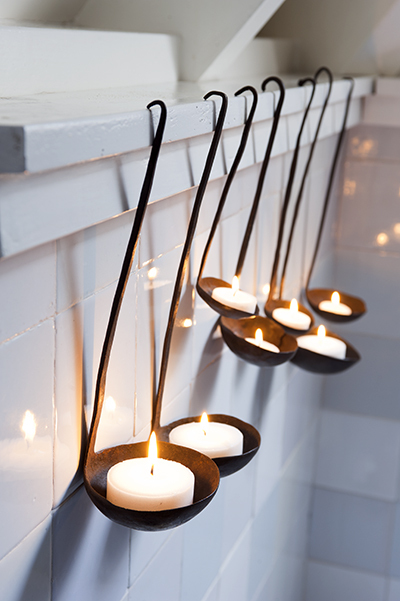 If the ladles don't appeal to you, how about this tea-light idea? It's a little more contained and probably a little safer. Instructions at Spruce Your Nest. There are lots of images of silverware chandeliers out there. 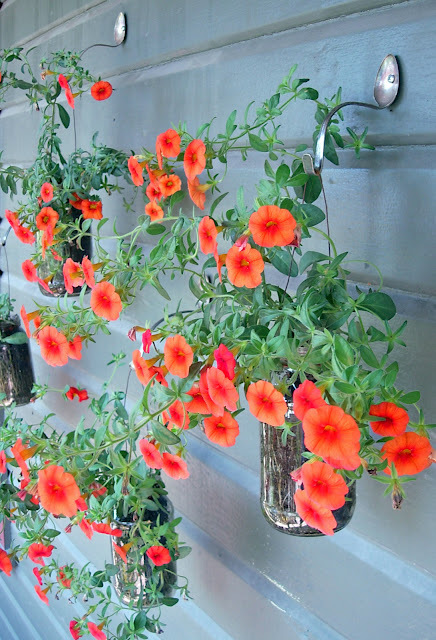 The one pictured above involves repurposing a hanging basket. Actual instructions here. 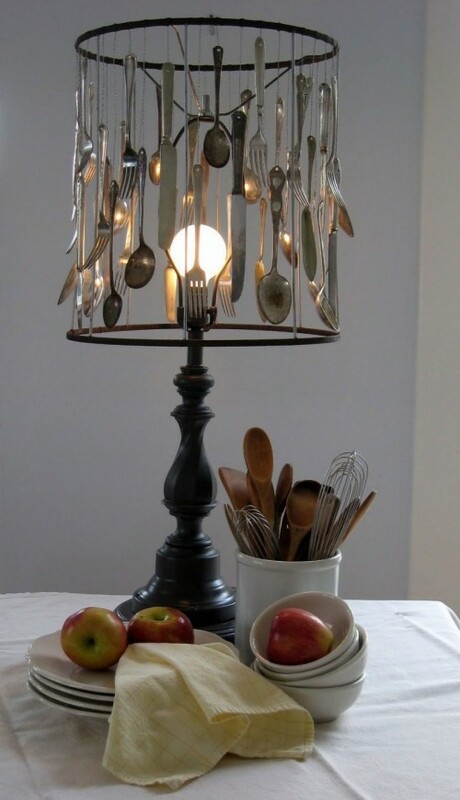 Very simple addition of forks to the top of the lamp. How about those shadows??! 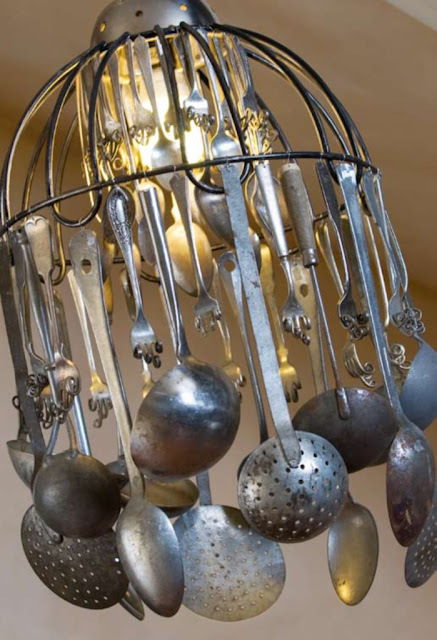 Ok, so maybe you wouldn't have a lamp like this in a kitchen. But nearby? Perhaps! And I love it. Instructions at Shelterness. 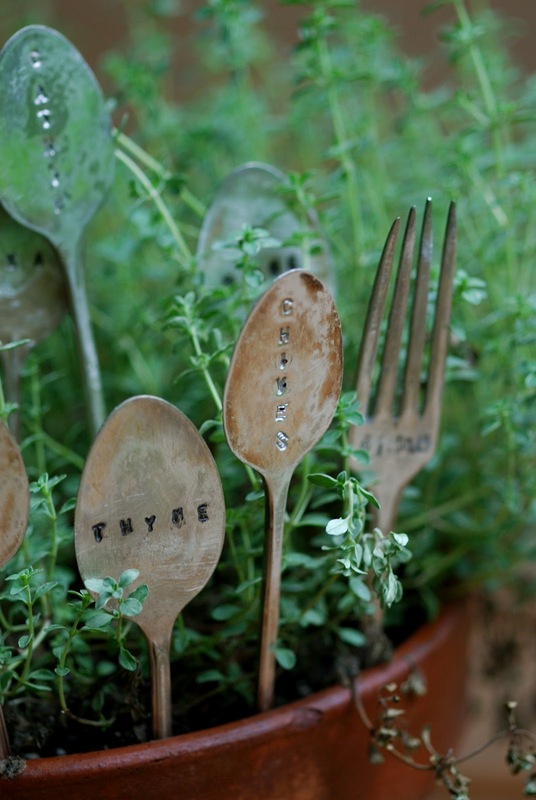 Markers for your kitchen herb garden ... from Mossy Mossy. 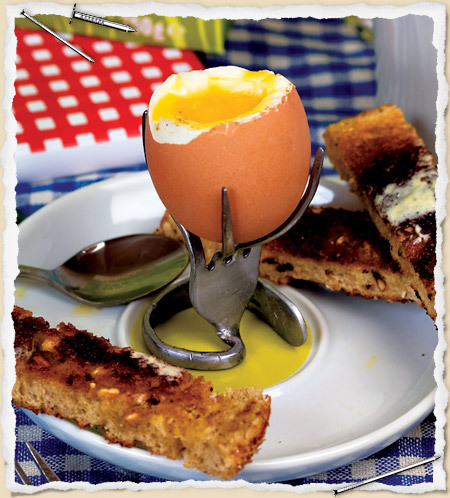 Turn an old fork into an egg cup! From one of my favorite re-makers: What I Made. 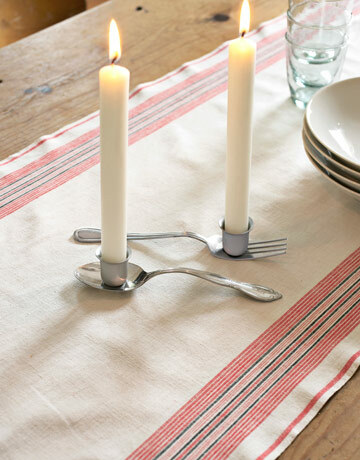 Easy-to-make candle holders ... I love the dishtowel table runner too. This great kitchen clock involves repurposing both an ugly old clock and old silverware! Instructions here. 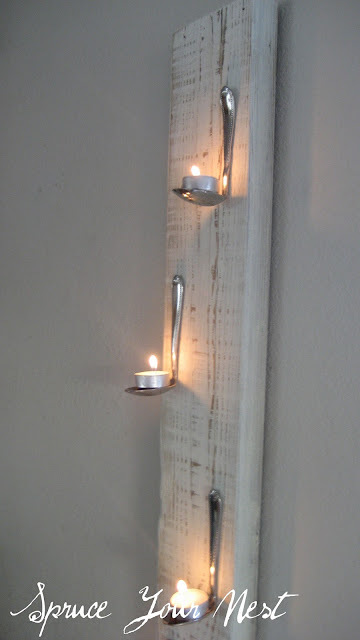 Another way to use spoons as hooks / hangers ... for a kitchen garden, of course! Care of Hutch Studio. 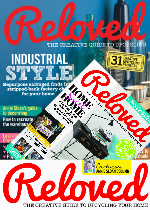 Take a look at the moss-and-airplant version too. 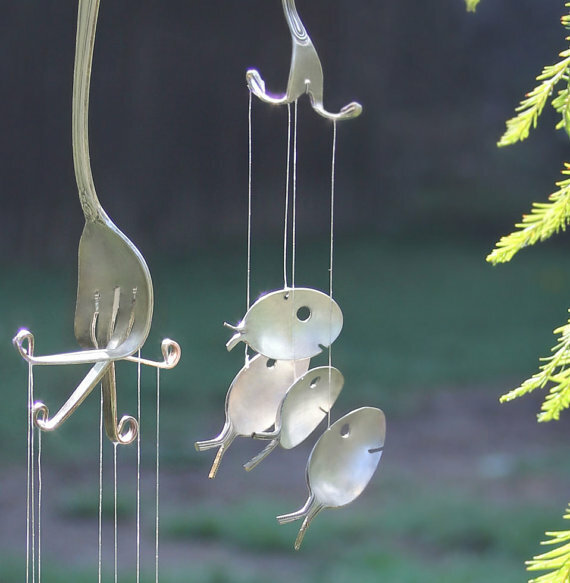 And finally, wind chimes. 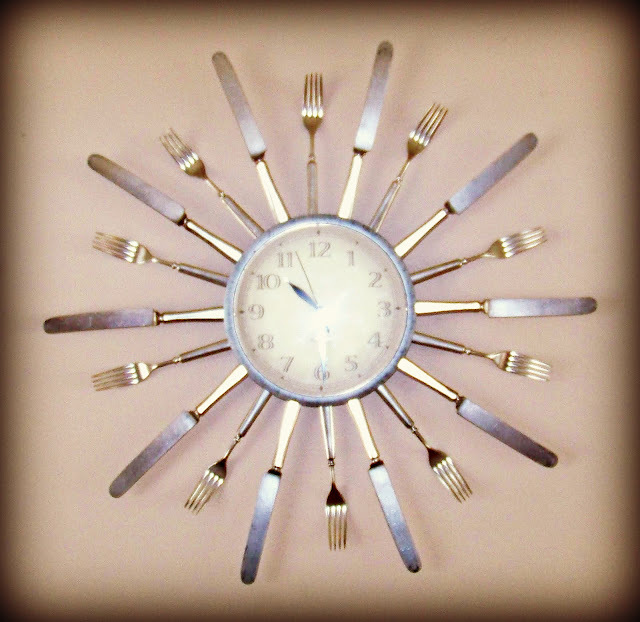 For a back porch / deck / balcony just outside your kitchen! 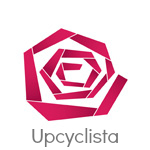 Great collection to inspire you here. 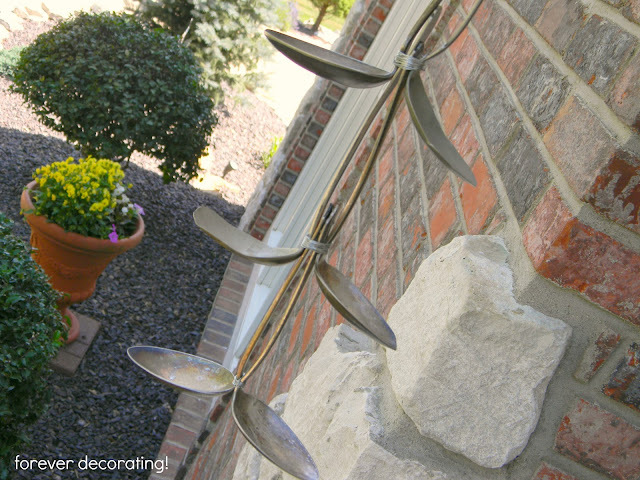 Simple wind chimes DIY here. 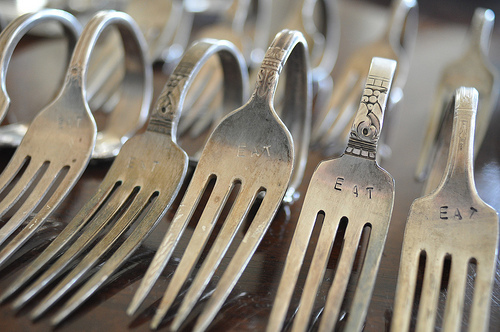 4 comments on "Upcycle: Silverware becomes Silver-everywhere! " OH wow! 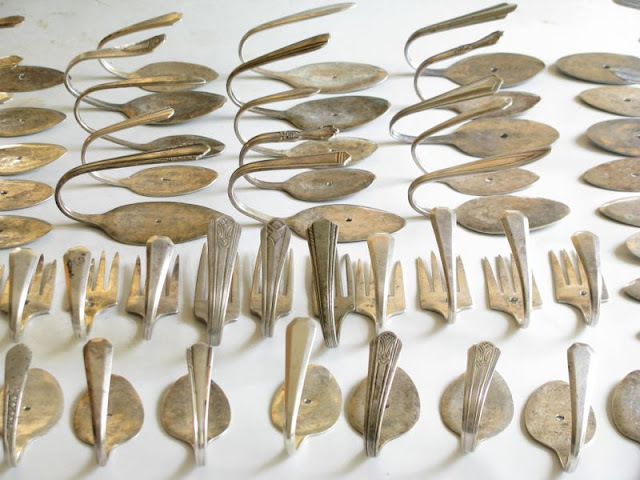 So many spoon ideas. Thank you for sharing. 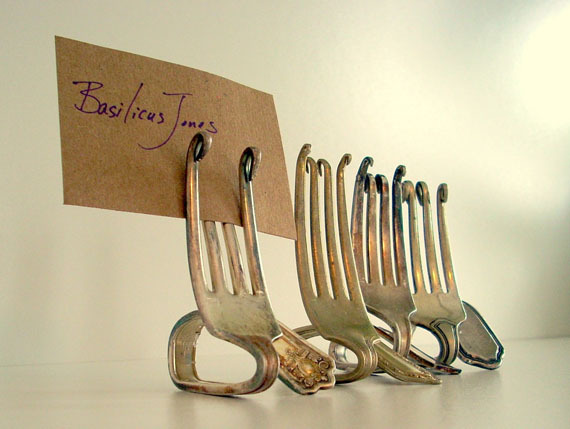 I'm wondering whether these ideas will work with "normal" stainless steel spoons. Glad you're inspired Beckie! I wish I could take the credit for these ideas, but I can't. 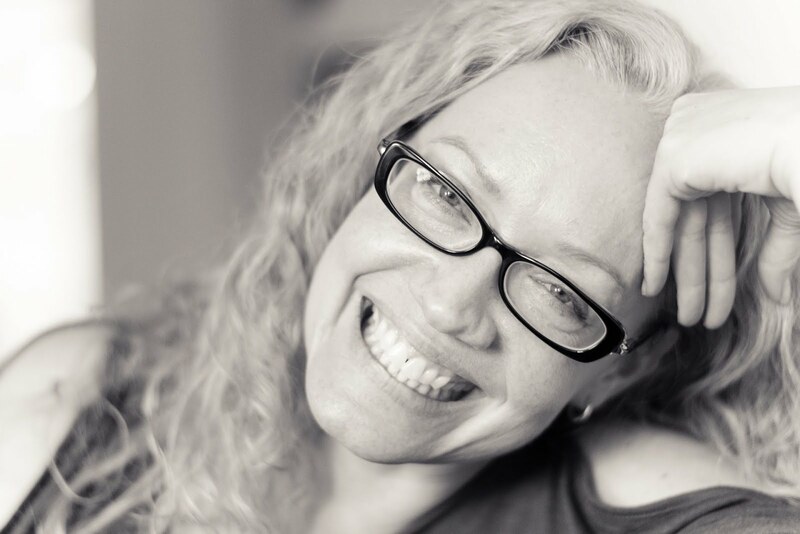 They come from many other wonderfully creative people - I just gathered them here. I really love all of these ideas! I love antique lookign things. I will probably do the garden markers for sure!